When humankind discovers Biomimetic Dark Matter, a universal element capable of assuming any natural characteristic, the possibilities unleash a destiny fueled by our darkest dreams. An evolved humanity known as Hibernarii pushes the universe to the brink of cataclysm. When ancient and new powers clash, nature will inevitably restore balance—with humanity, or without it. 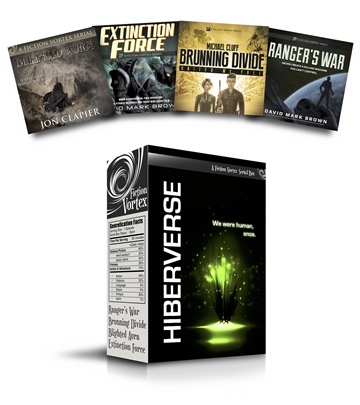 The Hiberverse is the first “serial box” for the serial fiction startup, Fiction Vortex. The brainchild of a ragtag, vanguard of indie authors, Fiction Vortex emphasizes imagination and fun. Tired of industry standards, we've decided to no longer take crap, so you don't have to read it.